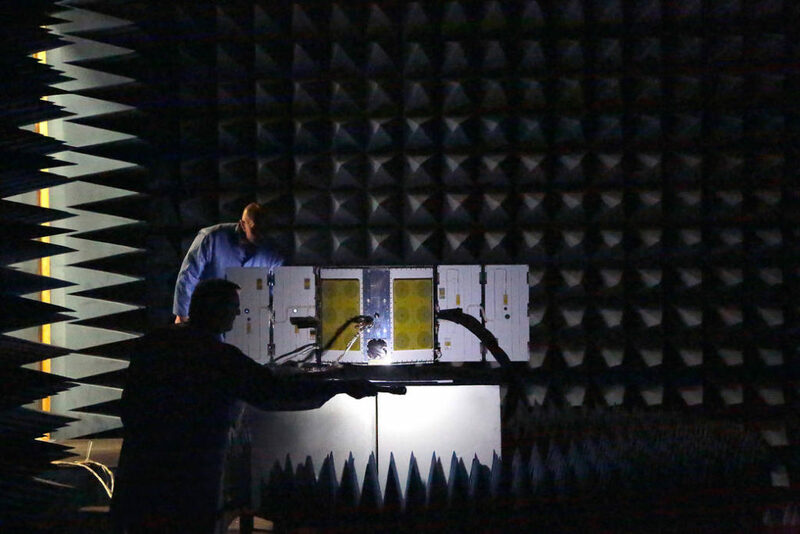 May 20, 2016 – As part of a series of environmental tests for NASA’s CYGNSS constellation, one of the eight microsatellites is placed in a radio frequency (RF) anechoic chamber at the Southwest Research Institute in San Antonio, Texas. Each microsatellite consists of an integrated suite of components such as star trackers, reaction wheels, avionics, communication radios, and global navigation equipment. This testing evaluates the RF interference between the microsatellite and CYGNSS’ highly sensitive instruments. Environmental testing of the constellation is expected to continue through July 2016. The CYGNSS mission is scheduled to launch in October 2016 and will be the first mission to probe the inner core of hurricanes in greater detail to better understand their rapid intensification. Sierra Nevada Corporation is designing a deployment module for the mission, which is designed to carry all eight satellites on one launch vehicle. When the rocket gets to just the right altitude, the deployment module will start up and deploy pairs of satellites in opposite directions. CYGNSS is funded through NASA’s Earth Science Division through its Earth System Science Pathfinder Program Office and developed by the University of Michigan.